Part of the motivation for splitting is in avoiding the tl;dr effect ;) Now, let's get back to the overview. We'll break down previous image box by box. We're basically just prototyping here, but to keep everything flexible and in the spirit of the newer architectural paradigms like Microservices the post will be split in 5 parts. The software will also be split so we won't use any specific container for our applications we'll just go with Spring Boot. In the posts we won't go much over the basic, you can always look it up in the official documentation. This is the reason why I'm doing this in the first place. It's this new super cool messaging system that all the big players are using and I want to learn how to put it to everyday use. For some time now I'm doing a lot of stuff with Apache Spark. But somehow I didn't get a chance to look into streaming a little bit better. It's a year where everybody is talking about voting ... literary everywhere :) so let's make a voting app. In essence it will be a basic word count in the stream. But let's give some context to it while we're at it. We won't do anything complicated or useful. Basically the end result will be total count of token occurrence in the stream. We'll also break a lot of best practices in data modeling etc. in this series. Series is for people oriented toward learning something new. I guess experienced and battle proven readers will find a ton of flaws in the concept but again most of them are deliberate. One thing I sometimes avoid in my posts is including source code. My opinion is that a lot more remains remembered and learners feel much more comfortable when faced with problems in practice. So I'll just copy paste crucial code parts. One more assumption from my side will be that the readers will be using IntelliJ IDEA. Let's got to Part 2 and see how to setup kafka. In this section we'll setup two kafka brokers. We'll also need a zookeeper. If you are reading this my guess is that you don't have one setup already so we'll use the one bundled with kafka. We won't cover everything here. Do read the official documentation for more in depth understanding. Download latest Apache Kafka. In this tutorial we'll use binary distribution. Pay attention to the version of scala if you attend to use kafka with specific scala version. In this tutorial we'll concentrate more on Java. But this will be more important in parts to come. In this section we'll use the tools that ship with Kafka distribution to test everything out. Once again download and extract the distribution of Apache Kafka from official pages. Before producing and consuming messages we need to create a topic for now you can think of it as of queue name. We need to give a reference to the zookeeper. We'll name a topic "votes", topic will have 2 partitions and a replication factor of 2. Please read the official documentation for further explanation. You'll see additional output coming from broker logs because we are running the examples in the background. Open two additional shell tabs and position yourself in the directory where you installed kafka. We'll use one tab to produce messages. And second tab will consume the topic and will simply print out the stuff that we typed in in the first tab. Now this might be a bit funny, but imagine you are actually using kafka already! We covered a lot here but writing from one console window to another can be achieved wit far simpler combination of shell commands. In Part 3 we'll make an app that writes to a topic. We'll also use console reader just to verify that our app is actually sending something to topic. 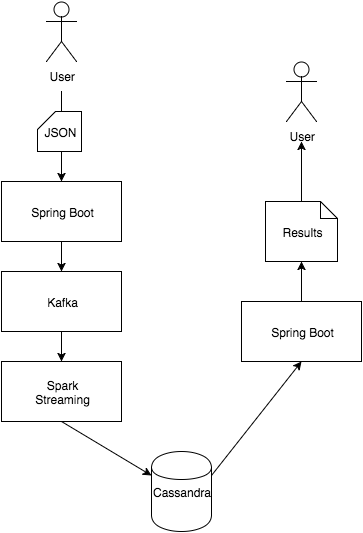 We'll go over the steps necessary to write a simple producer for a kafka topic by using spring boot. The application will essentially be a simple proxy application and will receive a JSON containing the key that's going to be sent to kafka topic. Pretty simple but enough to get us going. We'll use IntelliJ IDEA to set everything up. The easiest way to get started is by using Spring Initializr. This one will be automatically generated. Setup beans for the controller. Status to return to clients, we'll just send "ok" every time. If everything was fine you should see the name that you send in this json in the console consumer. In Part 4 we are going to go over how to pickup the data from kafka with spark streaming, combine them with data in cassandra and push them back to cassandra. 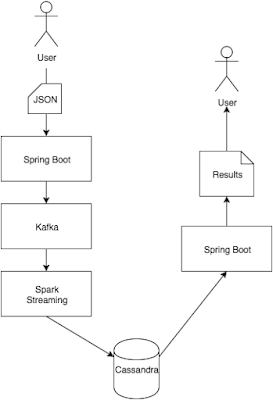 In this section we are going to use spark streaming to read the data in coming from kafka. We'll also combine it with the data already in cassandra, we're going to do some computation with it and we're going to put the results back to cassandra. The best practice would be to have a spark cluster running but for the sake of simplicity we are going to launch local spark context from a java application and do some processing there. We won't go into configuring Cassandra to run, there is plenty documentation there and it takes just minutes to setup. You can check how data changes by running select statements from voting table. In Part 5 we are going to make a simple spring boot project that displays and sorts the voting data. The posts are very well written and the pretty much describe all of the standard techniques when it comes down to working with time series data in Cassandra. But to be honest there isn't all that much code in them. This is partly to a fact that almost every project has it's own specifics and from my experience it often happens that even within a relatively small team there will be multiple implementations on how to bucket and access the time series data. For some time now I'm in the world if IoT and I find that explaining everything with a help of a simple temperature sensor is the best method to discuss the subject. Previously mentioned articles are also a good read. This section is sort of a warm up. Theoretically in most of the use cases we'll want to access temperature readings by some sensor Id and we know where this sensor is located. In the most simple case sensor id becomes the long row in cassandra and the readings are stored in it and kept sorted by time etc. However in some cases the temperature may be read very often and this could cause the wide row to grow to a proportion that is not manageable by cassandra so the data has to be split among multiple long rows. The easiest method to make this split is to make multiple long rows based on the measurement timestamp. How big should my buckets be? It may vary from project to project, but it depends on two important factors. How many readings are you storing per single measurement and how often the measurement is happening. For instance if you are recording a reading once per day you probably don't even need the bucketing. Also if you are recording it once per hour the project you are working on probably wont't last long enough for you to run into problem. It applies to seconds too, but only for the most trivial case where you are making a single reading. If you go into frequencies where something is happening on the milliseconds level you will most definetly need bucketing. The most complex project I worked up until now had time bucketing on a level of a single minute. meaning every minute, new bucket. But that project is not in the IoT world, In that world I'm using partitions on a month basis. That's it, combine this with your sensor Id and you get buckets on a day level basis. Now the problem is how to retrieve the measurements from buckets. Especially if you have to fetch the measurements across multiple buckets. We'll go over this in the next section. Bare in mind that you should keep buckets in time series data easy to maintain. Also try to avoid having multiple implementation for the same thing in your code base. This section will not provide 100% implemented examples but will be more on a level of a pseudo code. When you are fetching the data from the buckets, you will have two types of query. One is to fetch data out from the bucket without any restrictions on measurement time stamp. The other is when you will want to start from a certain position within the bucket. Again there is a question of ordering and sorting the retrieved data. I worked in systems having all sorts of practices there, most of the time reversing was done with a help of a specific boolean flag but my opinion is this should be avoided. It's best to stick to the from and to parameters and order the data according to them. i.e. That way you don't have to break you head and think about various flags passed over the levels in your code. String statement = "SELECT * FROM readings"
This is just a high level overview of how to move among the buckets. Actual implementation would actually be significantly different from project to project. My hope for this post is that you give the problems I faced a thought before you run into them. For some time now spring data with cassandra is getting more and more popular. My main concern with the framework is performance characteristics when compared to native cql driver. After all with the driver everything is under your control and one can probably squeeze much more juice out of cluster. O.k. I admit it's not always about performance. If that would be the case we would all be writing software in C or assembler. But still I think it's a good practice to be aware of the drawbacks. To be honest spring data cassandra is relatively new to me. I did the performance comparison on the lowest level without using repositories and other high level concepts that come with spring data cassandra. My focus in this post is more on the generics that decode the data that comes out from the driver. To make a comparison I'm going to use a simple cassandra table (skinny row), then I'm going to make query after query (5000 and 10000) towards cassandra and after that I'll decode results. Once again the focus in this post is not on performance characteristics of higher order functionalities like paged queries etc. I just wanted to know by a rule of thumb what can I expect from spring data cassandra. This row is fetched every time, to detect differences We'll see how long the iterations last. Network and cluster is also out of scope so everything was tested on local running datastax cassandra community (2.0.16) instance. avg: 5920 - 10.88 % slower than with 3 fields! Spring data cassandra may be very interesting if you are interested to learn something new. It might also have very positive development effects when prototyping or doing something similar. I didn't test the higher order functionalities like pagination etc. This was just a rule of a thumb test to see what to expect. Basically the bigger the classes that you have to decode the bigger the deserialization cost. At least this is the effect I'm noticing in my basic tests. There was an interesting follow up disuccion on reddit. By a proposal from reddit user v_krishna another candidate was added to comparison Object-mapping API. Object mapping from spring data seems to be just a bit slower then object mapping available in new driver. I can't wait to see the comparison of two in future versions. Initially I was expecting around 5-10% percent worse performance when compared to object mapping capabilities. It surprised me a bit that the difference was more on the level of 25%. So if you are planning on using object mapping capabilities there is a performance penalty. In the previous post we went over the steps necessary to make a sensor for a small greenhouse for the balcony. 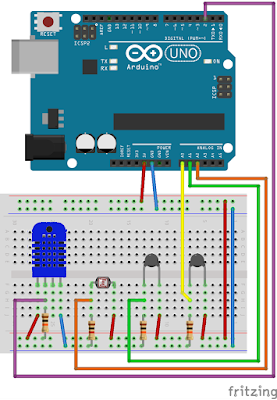 To install Arduino libraries please consult the previous post. 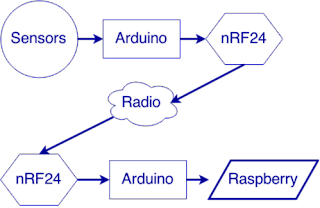 The wiring for the nRF24 is the same as in the previous post. 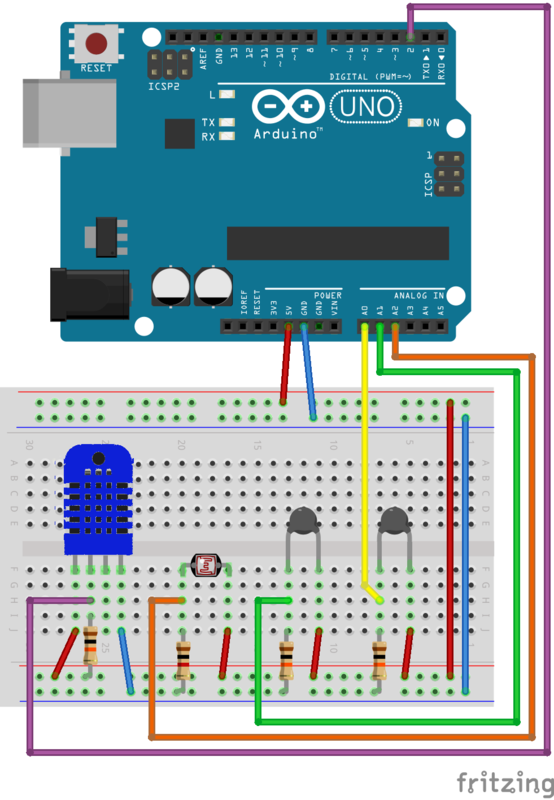 The example has two temperature sensors. One is for the outside and will be connected with longer wires. You'll have to compare the readings from both sensors in the same environment and see the offset in the readings. The humidity sensor can also read the temperature but it is not very precise and is relatively slow. We'll use this value simply as a check value. Generating and handling the load on this scale requires the infrastructure that is usually not available within a personal budget so I turned to Amazon EC2. I listened about the EC2 for quite some time now and It turned out really easy to use. Basically All you have to do is to setup a security group and store the "pem" file for that security group. Really easy and if anybody didn't try it yet there is a free micro instance available for a whole year after registering. I won't go into details of how to setup the security group. It's all described in the DataStax documentation. Note that the security definition is a bit extensive and that defining the port range from 1024-65535 is sufficient for an inter group communication and I didn't expose any ports to the public as described in the documentation. The second part is generating the key pair. In the rest of the document I'll reference this file as "cassandra.pem". Note I've added c4 node because I was limited on the amazon with the number of instances I could boot. I've spent most of the time on the app part when developing. The basics for the component handling the requests was netty listener. In one of my previous posts I described how to use netty to handle http requests and acknowledge them with HELLO message. Here I acknowledged them with OK. The most complicated part with the messages was sending them to cassandra as fast as possible. The fastest way to send them is to use executeAsync. Initially I had trouble with it where I was loosing messages. Some of the issues were due to concurrency. Some were due to poor understanding of the DataStax driver. Concurrency - Basically what I was doing was that I tried to save on instantiating the BoundStatement instances because of the overal speed. The BoundStatement is not thread safe and after calling the bind method it returns "this". It took me some time to figure this out because when used in loops this behavior is not dangerous. Anyway, thanks to colleague I figured it out. // don't reuse and make multiple calls with .bind()! Asynchronous execution - also a bit tricky. The executeAsync returns a future. Initially I was just adding it to Futures. The instances come with Open JDK installed. This doesn't guarantee the best performance so I installed the Oracle java. In order not to loose the time on firewall setup I simply copied the "cassandra.pem" file to every node. wget --no-check-certificate --no-cookies - --header "Cookie: oraclelicense=accept-securebackup-cookie" "http://download.oracle.com/otn-pub/java/jdk/7u71-b14/jdk-7u71-linux-x64.tar.gz"
Note I've added c4 nodes because I was limited on the amazon with the number of instances I could boot. Also I had to request it with the customer service but I couldn't assume how many instances of every type I'll use so the instances are not of the same type for load and app servers. Setting up the Cassandra is the easiest part of the whole undertaking. All I did was following this guide by DataStax. In the end it took me around 30$ to reach the 100k limit. I'm afraid to calculate how much this setup would cost on a monthly or yearly basis. Finding examples for netty took me a lot of time. Most of the time writing even the smallest portions of code requires you to go trough multiple sources ranging from youtube videos to official netty documentation. In this post I'll show you how to build a basic netty http hello world example. You probably won't have any trouble to continue and write your own app from here. From time to time having just one Cassandra instance installed on your machine is not enough because you want to test certain behaviors when Cassandra cluster is up and running. Having extra spare hardware on the side or processing time on amazon is not always an option. 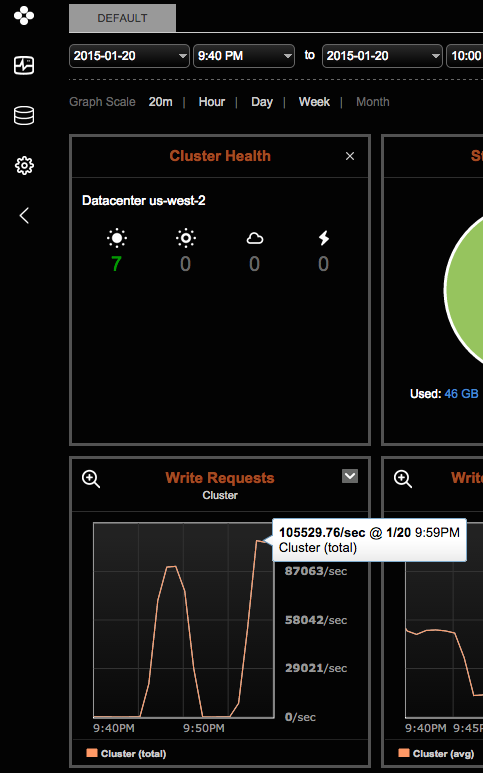 So it's a good idea to setup a simple cluster on your own machine with instances in virtual machines. This post is going to show you how to do it with VirtualBox. The reason why I chose VirtualBox is that there are lot of free virtual images available. Most of the time you'll be installing Cassandra on a Linux machine. I decided to go with the CentOS. Head over to http://virtualboxes.org/images/centos/ and download CentOS-6.6-x86_64-minimal. The default settings are fine for every machine. Create couple of them, give them names so that you can differentiate between them (Node1, Node2, etc. ...). Perhaps the best idea would be for you to setup one node first and then make copies afterwards. Do not forget to set the network to bridged adapter. The username and password for the virtual machines are probably set to "root/reverse" but check those options when downloading the virtual box image. To keep it short I'll just continue with using the root user. When doing things in production it's an extremely bad practice. When VirtualBoxinitializes the networking on the virtual machine it put a new mac address to a file. There seems to be a bug where this mac address is not transferred from that file to the virtual machine settings. Run the following command and copy the MAC Address. $ wget --no-cookies --no-check-certificate --header "Cookie: gpw_e24=http%3A%2F%2Fwww.oracle.com%2F; oraclelicense=accept-securebackup-cookie" "http://download.oracle.com/otn-pub/java/jdk/7u72-b14/jdk-7u72-linux-x64.tar.gz"
Now make copies of this machine and update cassandra.yaml file with the ip addresses of the new machines. Also do check /var/log/cassandra/system.log to see if other nodes are joining in.